Beth Rickard can't help being an environmentalist. Being an activist for the planet is a part of her… like breathing. She grew up in Arcata, California. Arcata, some say, is the Haight-Ashbury of the redwoods. This town of almost 17,000 has a council dominated by the Green Party, is the country's pioneer in biological wastewater treatment and is home of the innovative Arcata Marsh and Wildlife Sanctuary, an ecology movement that has managed to co-exist productively with the timber industry. Located 275 miles north of San Francisco, Arcata is home to Humboldt State University, where parts of their facilities are "off the grid" and they power rock concerts with pedal power. (Kids actually pedal bikes that produce the required energy.) Beth says, "I've been a tree hugging hippie since birth. 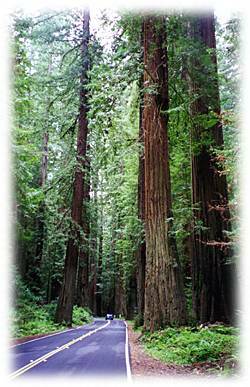 Growing up in Arcata, in the redwoods and on the coast of California; nature has always been my inspiration. My passion for environmental protection all began as I watched the destruction of the redwood forest in my backyard." Over the years Beth has become a passionate advocate for many causes, from recycling in her elementary school years to sustainability, conservation, and environmental justice. "Arcata really is an amazing place; positive activism is a way of life. The community feeling and positive idealism has definitely guided me to where I am now. I am always looking for ways to leave a trail of goodness behind me." More recently, however, Beth's "positive idealism" has taken on a sense of urgency. "(In light of) rising oil prices and environmental reports on pollution and global warming, I became very concerned with the energy situation in this country. (When) I began researching the issue, I was overwhelmed with the magnitude of the problem. Our addiction to fossil fuel is not only an environmental issue, but a labor issue, an economic problem, a human rights issue, and an international emergency. The longer we neglect to make our society sustainable, the greater the environmental damage and burden for future generations." Inspired by a high school community service course, Beth came up with the idea to install solar panels at her school and subsequently founded Arcata High School's Conservation and Renewable Energy (CARE) program. "Our primary goals were: 1) To teach students and the community about energy conservation and renewable energy, 2) to install solar energy systems at the high school and monitor their efficiency, 3) to train students and teachers to conduct an energy audit of the school and then propose conservation measures to the school district, and 4) to launch a social marketing campaign to change wasteful or inefficient use of energy." Beth and her team wrote and received large-scale grants to conduct solar energy research at school, to install a $20,000 solar array and to demonstrate the efficiency of the solar panels in a town that has lots of cloud cover. C.A.R.E. took advantage of another grant to install and test the efficiency of a solar water heater and more energy-efficient lighting. What is solar power? Solar power is energy from the sun's radiation converted into heat or electricity through the use of photovoltaic cells. According to Steve Hester from the Solar Electric Power Association (SEPA), when sunlight strikes a PV cell, electrons are dislodged, creating an electrical current. The most widely used material for PV cells is silicon, a semiconductor. The silicon is "doped" (that is, it has a certain amount of impurities placed into the silicon crystal) with either boron or phosphorus to give it the properties needed to be a PV cell and give up electrons when exposed to light. The photons of light (photons are actually small particles of light) 'knock' the electrons out of the outside band of the silicon atom and that is what creates the PV effect. The results for C.A.R.E.? According to Beth, "Solar is the energy of the future. It is simple, environmentally friendly and cost-effective. The energy payback time for modern solar panels is 2 to 5 years and the average lifetime is 30 years. As a result of our efforts to make the school go solar, we have two comparative demonstration arrays and one large system. The school is 36% solar powered. This will save the school approximately $30,000 per year. We don't have figures for how much energy was conserved, but the Green Schools system is in place and the school will continue to make energy improvements. The school administration has agreed to give 50% of the money saved by our recommendations back to CARE for further improvements. Every year students and teachers will be trained to conduct energy audits through Green Schools and the group will be active on campus promoting conservation." Beth went beyond sharing this sustainability vision with local elementary, middle and high schools. She took her passionate stance on the science of sustainability to the Million Solar Roofs Initiative and she participated in a renewable energy summit in Washington, DC. So what's it like to be a teenager bringing the science of the future to the powers that be? "When I was lobbying at the state capital I felt empowered. These policy-makers have my future in their hands. I felt that it was my responsibility to speak out to change our energy future. As I expressed my support for the solar bill, I felt that my voice was taken seriously. We presented ourselves with petitions, letters of support, and research of the benefits of the Solar Initiative. We were treated with respect and I believe (we made an impact)." She went on to say, "When I went to the Energy Action Conference in Washington, I felt inspired. Young activists from all over the US and Canada united to build a coalition of progressive organizations for a sustainable future. There were groups from college campuses and nonprofits that focus on renewable energy, conservation, global warming, sustainability and environmental justice. I was the only high school student. I represented a part of the youth environmental movement that is often overlooked. I demonstrated that high school students can work within their community and make important contributions. I returned home with loads of new ideas to put into action." And what is this committed teenager doing these days? I found Beth taking grade 12 again… no, she didn't fail… she decided to take grade 12 over, but this time she would take it in Dutch, as an exchange student in Antwerp, Belgium. She's studying Math, Science, History, Philosophy, Geography, and Art, as well as classes in guitar, songwriting and jazz. "I am living with a family, teaching myself how to communicate and trying to understand this new lifestyle and culture." How's that for a gap year? Beth comes by her worldliness quite honestly because her hero happens to be part of the family. He is her Great Uncle Howard Sollenberger, the US diplomat. In her words, "He made a family everywhere he went, always giving, loving and inspiring. He grew up in China and spent his youth working with underground communist groups to feed the starving, demoralized people during Japanese invasion and civil wars. After being expelled from China, he became a US diplomat to China and worked to bring understanding between nations and aide where there was suffering. He was integral in creating the Peace Corps. His ideals of service, peace, and understanding were central in everything he did. He believed in Stewardship of the land, like his Quaker family before him." Beth's uncle once said, "There is a balance between humans and the earth, and we must take care to respect it." This is a message that Beth has obviously taken to heart. "I have never seen anyone enjoy life like he did. He never lost his curiosity and there was a delightful sparkle in his eye until his last day on earth." What were Beth's favorite subjects in school? "The most important part of my high school education was being involved with CEDAR Academy. I taught myself everything along the way to direct my energy project. I gained experience in solar installation, energy auditing, journalism, public speaking, education, grant-writing and team-building. The greatest satisfaction is in knowing that I took initiative and relied upon myself every step of the way." So this high school student who likes music as varied as Nina Simone, The Velvet Underground and Manu Chao, who watches movies from Strictly Ballroom to Jesus' Son to Amelie and who reads everything from The Teachings of Don Juan to A Clockwork Orange is still trying to figure out what she wants to take in college. "I haven't decided on a major because I have so many interests and I am still searching for the path that suits my talents the best. I have a big dream that I will save the world someday." A dream we all hope comes true. Tiki the Penguin - This is a really funny website for really young kids to get an idea of what sustainability is all about. Alliance to Save Energy - Great resource for all sorts of energy info and projects. Includes Green Schools, an international program to save energy in schools, lead by students and teachers. NOTE FROM BETH - I would tell all the kids that are interested out there to contact Green Schools and start a project. There is a great support group and resources are available. Beth Rickard is a 2005 Barron Prize Winner. The Gloria Barron Prize for Young Heroes honors outstanding young leaders who have made a significant positive difference to people and our planet. Their leadership and courage make them true heroes — and inspirations to us all. Each year, the Barron Prize (www.barronprize.org) selects ten winners nationwide. Half of the winners have focused on helping their communities and fellow beings; half have focused on protecting the health and sustainability of the environment. The goal of the Barron Prize is to celebrate heroic young people — and to inspire others to do their part. Like the woman for whom the prize was named — Gloria Barron — these young people demonstrate the power of one person to make a difference to the world.